The Para Ordnance Executive Carry 1911 in .45 ACP combines a compact, lightweight bobtail frame and 3" barrel for maximum performance and concealment! The Para Ordnance Executive Carry compact 1911 in .45 ACP utilizes a bobtail Ed Brown mainspring housing for optimum concealment: minimal printing, maximum grip. As such, this unique handgun fits in nearly any 1911 holster, including the horizontal shoulder rig from Galco, and the DeSantis Mini Scabbard used in the video, making it ideal for concealed carry. Scroll down to see the video! 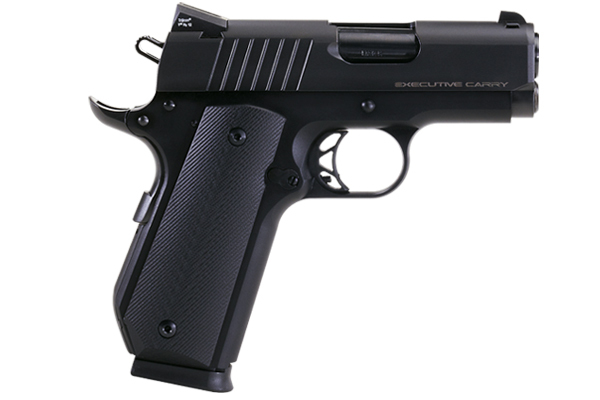 Packing 8+1 rounds of .45 AUTO is afforded via the full-height frame, yet the Executive Carry remains a feather-weight gun (see a review of it’s big brother, a double-stack juggernaut, the Para P14-45 HERE!). This is mainly due to the combination of aluminum-alloy body and compact 3″ barrel. This 3″ barrel out-performs, though, with exceptional accuracy, as tested using Federal Hydrashok, Hornady Critical Defense, and CCI Gold Dot. Combine that with Trijicon night sights, a skeletonized match grade trigger, Ionbond and anodized finish, as well as VZ machined G10 grips, and the Para Executive Carry compact 1911 is a compact powerhouse, loaded with premium features. 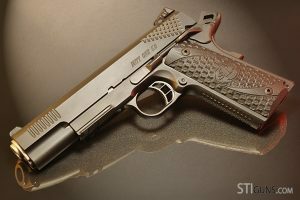 Look for a complete review in the June issue of Combat Handguns!